Two comics from February 12, 2014. Plus your Nerd Confessions (about the best fights in comics) and we respond to the recent declaration of war from Assemble After Dark. On The Couch: writer and artist Dan Goldman. This week’s theme is WAR. Good god, y’all. Apropos of nothing our friends Ben Bailey and Joey Esposito from the Assemble After Dark podcast have declared war on Comics Therapy. Yeaahhhh. We don't know what that means, either. You all should check their show, however. And in the meantime, it seemed like the perfect opportunity to talk about fighting. Especially since it’s Valentine’s Day. It’s so meta, we can’t stand it. A frighteningly plausible look inside high-stakes weapons development in the US military, that somehow manages to feel neither too unapproachably political nor too military-centric. Tony Stark has nothing on Dr. David Loren. The real story of the Lewis & Clark expedition, complete with minotaurs (not minotaurs) and zombie plants. This is war of a different, more fantastical sort. Dan’s ongoing series Red Light Properties is published digitally by Monkeybrain Comics and available on Comixology. The brand spanking new print edition is out this month from IDW. 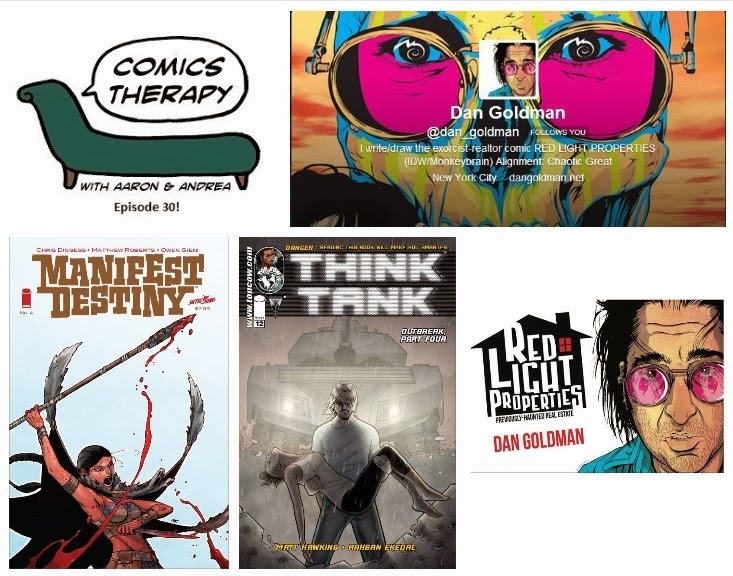 Dan’s website is a dynamically interactive tour of his other work, from the Eisner-nominated web comic Shooting War to the nonfiction comics journalism 08: A Graphic Diary of the Campaign Trail. Go check it out.